Touch (n): An act of bringing a part of one's body, typically one's hand, into contact with someone or something. (v) Come so close to (an object) as to be or come into contact with it. Contact (n): The state or condition of physical touching. Now, I will try to present another definition of touch and contact. - The state where objects have overlapping electron probability clouds. - This definition can be refined over time, to include at "90%" probability maybe (definitely not at 100%). Another Idea: Words are only defined for the 99% and will never include the truly technically correct definitions. ...Assuming present paradigm. The present you and the future you are two different people. The future self has more experiences than your present self. It is easy to think with your present self, and that's what most people do. So which self would you rather think with? Now, to tie this with a practical example -- the procrastination hack part. What would your future self say at the present moment? What does your present self want to do right now? Social media? YouTube? What would your future wish you did right now? Learning? Went out with friends? Remember, your future self will always be smarter than your present self. So, go ahead and raise your IQ, live a better life by thinking with your future self. ps - Another way of thinking about this is, what would you say to your younger self? How would you do things differently? Is there something that you wish you could change from the past? The T in "often" is not pronounced! I first learned this in a public speaking book. Then, I checked Google. Then, I checked The Merriam-Webster Dictionary (paperback style, 2004) which also says the word "often" is pronounced "o-fen". And just now, I used TheFreeDictionary.com to hear the word pronounced in an American and British accent. To technically be correct about anything "assuming present paradigm" must be appended to everything. First version would just be changing forward velocity to rotational energy. Or somehow, by moving forward, we could store a negative rotational energy. When stopping, apply a positive rotational energy and overall, not feel the effects of slowing down. Most people who have heard of inertia dampeners may think of space ships in tv shows and movies. But, I want to apply inertia dampeners to vehicles here on Earth. For example, a car crash would be significantly less fatal if the effects of gravity and Newton's Laws of Motion weren't in play. We all talk to ourselves whether it is aloud or not. Another word for "talking to yourself" is "thinking". When you are thinking, there is typically a conversation of whether or not something should be done or what should be said. The only time you aren't talking to yourself is when you are strictly doing, which is a tough thing to do. Certain substances limit inhibitors. Which, in turn, arguably allows for more creativity. Free writing is also great practice in "strictly doing" aka creativity. ps - My initial seed of an idea for this post was just "Talking to myself = Thinking from different perspectives." And, originally, that's all this post was going to say. I didn't want to talk about creativity in this post because I have a lot to say about it, but not enough time. Hence, the abrupt stop. Get a new perspective of your surrounding by looking up. Today, while I was leaving my class to go home, I decided to look up as I walked down the stairs and saw parts of the building that I never saw before. Same thing when walking outside also. I may have ran into a few people, but it is worth it for the new experiences. You may have seen intricate origami including cranes, insects, and other animals and figures. These are the most popular ones. Today, I just learned about the OrigamiUSA convention held annually and about the great origami achievement known as Mooser's Train. 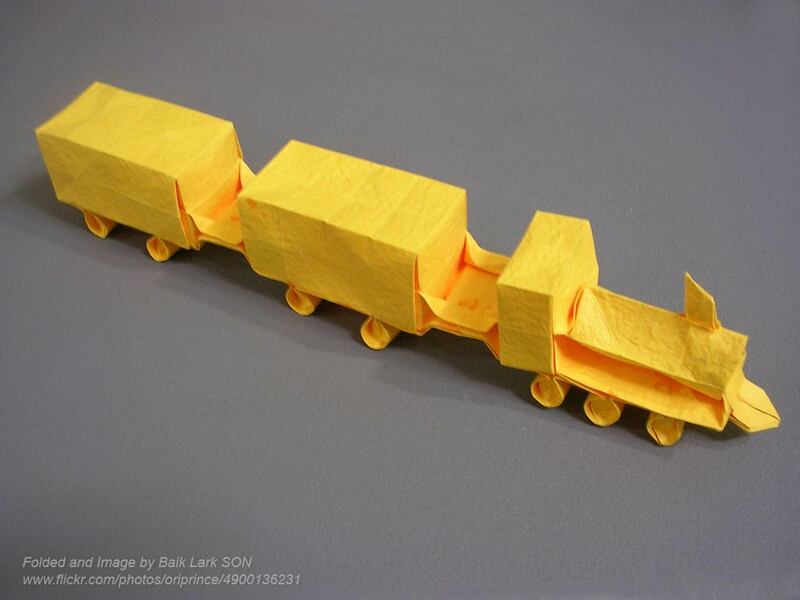 Emmanuel Mooser created a three-car model locomotive from a single sheet of paper. It was folded with a method known as the box pleat, which has been used in many other real-world applications, such as air bags and transforming robots. Mooser's Train just looks awesome. And after seeing it, possibilities are opened for even more intricate designs made with a single sheet of paper. It is typically portrayed that computer programmers are always at their computer writing code and are less social than average. But, I'm going to present another perspective. Perhaps computer programmers are the most social in regards that they write many programs for others and society. In order to be a great programmer, one must know how the market thinks. Walking is a constant act of rebalancing.